Normally, the rule is to not buy anything offered to you in a trash bag from an (almost) unmarked white van. 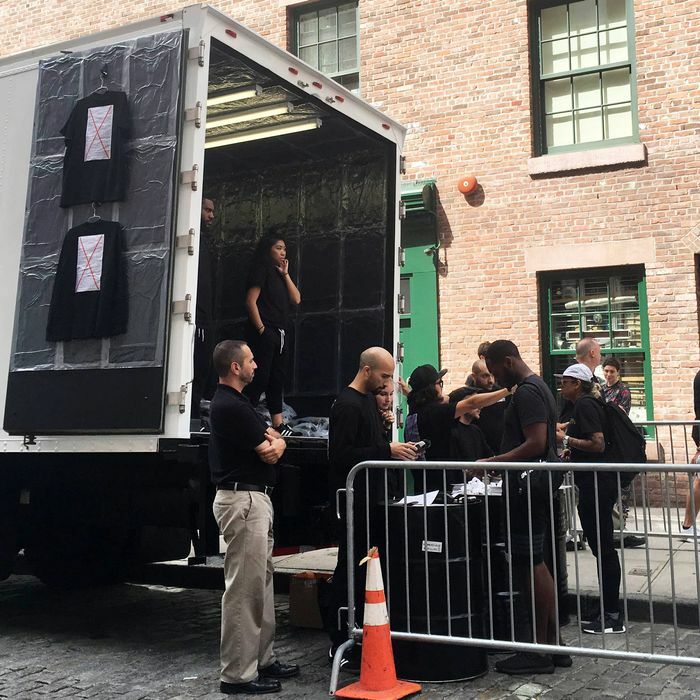 But, when the one mark on the van is “Alexander Wang” with an upside-down Adidas logo, you make an exception. The designer announced last night at his SS17 runway show that he was collaborating with the athletic brand and getting his own piece of the high-priced-sneaker pie. The first nine styles of the 84-piece collection are available today in NYC from the back of the aforementioned white van — three varieties of sweatshirt, black shorts, black track pants, three varieties of t-shirt, and a minimalist sneaker. For collectors on a budget, the black graphic tee is $80. The jacquard track pants (yes, jacquard) are $210. The tops feature Wang’s NDA for the project with a red X through it. People — both sneaker collectors and Wang superfans — started lining up at 3 a.m., just six hours after Wang’s collection began. By noon, the line had stretched almost two blocks, from Canal and Mercer to Mercer and Grand. 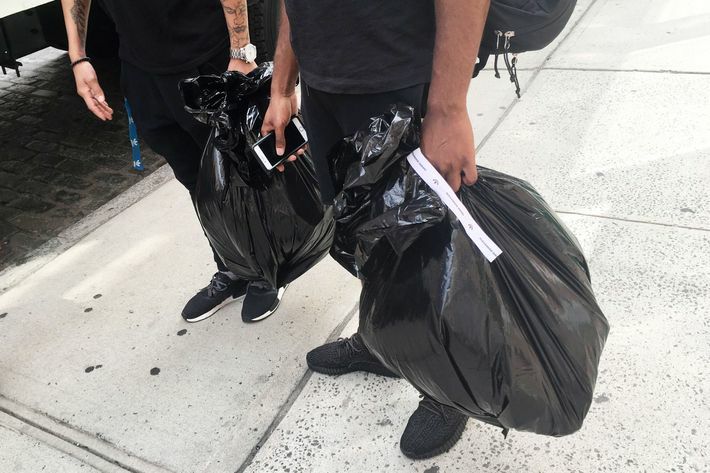 Promptly at 12, black-clad Wang/Adidas ninjas jumped into the back of the truck and started pulling out merchandise, putting it into black trash bags (a nod to the other Canal Street vendors? ), and tying it with a white Alexander Wang bow. Truly a mix of high-low to rival Anna Wintour’s Christian Lacroix top/blue-jean pairing on the cover of Vogue in 1988. It was only selling at Canal for an hour before moving to Fifth Avenue and 57th Street at 3 p.m., and McCarren Park in Brooklyn at 6 p.m. It’s also stopping in London and Tokyo (presumably not the same van) on September 17. For more information, call 917-325-3342, or follow @AlexanderWangNYC. The truck did not offer the McDonald’s that Wang’s show had, but a McDonald’s location was a mere block away, for any fans looking to ad-hoc their own #WangFest.